One of my happy chores in spring is cutting grass. Finally it greens up, making our yard look alive and cutting it brings memories of summer rushing to my mind. It’s a happy, alive kind of feeling. Our horses feel it too, judging by the audience they give me when I’m cutting grass next to the pasture fence. I let the grass grow a little too long this time so I ended up with lots of grass clippings everywhere and I could tell the horses coveted the lush piles of freshly mowed fescue. It would have been so easy for me to scoop armfuls and throw it over the fence but I remembered an article Mikki found years ago that talked about the dangers of feeding horses cut grass. It mentioned the story of a woman who came home one day to find her horse had colicked and died as a result of eating grass a well-intentioned neighbor threw into her pasture. How sad for the neighbor and how devastating for the horse owner. Grass from your lawn may contain fertilizers or anti-weed (herbicide) or anti-insect (pesticide) chemicals that should not be consumed by horses. Recently cut grass doesn’t dry uniformly, leaving wet clumps that can ferment and grow mold and mildew. Microbes introduced this way can cause colic in horses. Unlike lawn clippings, hay grass is tetted and sometimes re-tetted (spread out evenly in a thin layer) and dried/cured in the field before baling. A mouthful of small cuttings may be quickly consumed by a horse. The small, wet clumps can compact and stick in a horse throat. Hay or fresh grass is chewed in manageable amounts. The horse digestive system works best with consistent feeding. It adapts well but not quickly (as in day-to-day). Sudden shifts can lead to digestive problems and laminitis. There may be more reasons but that list is enough for me. I’ve read several comments from horse owners online who say they feed grass clippings to their horses all the time without negative results but I’ve also read several who experienced colic, laminitis and death. With all of the potential negatives, why risk it? It wouldn’t hurt to kindly mention to neighbors that feeding anything outside of a horses regular diet could kill them. Some horse owners even put up signs on their fences, which seems like a good idea. Most of us can’t monitor our pastures all of the time. I’d love to hear your thoughts on this. 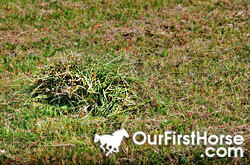 Have you had a bad experience with grass clippings and horses?